Women may have made measurable progress in the workplace over the last few decades, yet old ways die hard. Women still lag when it comes to holding top managerial positions. And among those with a preference, both men and women say they prefer male bosses and co-workers. Only 24 women (about 5%) currently are CEOs of Fortune 500 companies, according to an analysis by Catalyst, a nonprofit seeking to expand opportunities for women. 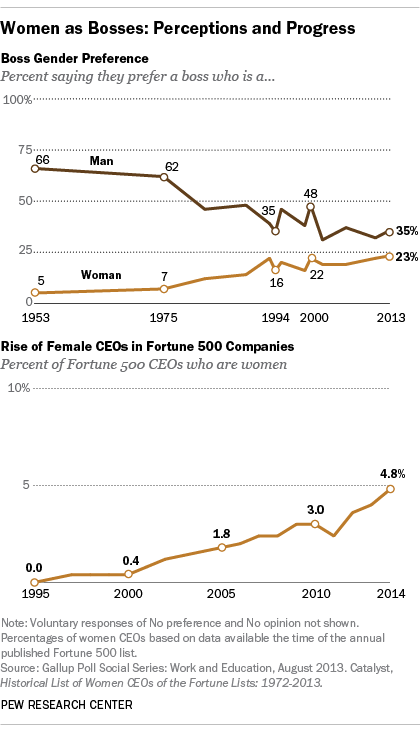 Yet this is up from 20 female CEOs in 2013, and only one in 1998. Less than 9% of top management positions are filled by women, and the rates have declined in some key sectors in recent years. A similar analysis by Catalyst last year — this one looking at Fortune 1000 companies — found 45 women CEOs, up from 16 a decade prior, but still less than 5% of all top jobs. Gallup has been tracking gender preferences in the workplace since 1953, when fully two-thirds of American adults (66%) said they would prefer a male boss if they had a choice in a new job. Another 25% volunteered that it made no difference, and only 5% said they would prefer a female boss. As of November 2013, the gap has narrowed but remains. A plurality (41%) say it makes no difference, but the rest prefer a male boss over a female boss by 35%-23%. Women are the most likely to say they prefer a male boss, according to Gallup. Though half of men (51%) say they have no preference for the gender of their boss, only 32% of women agree. Fully 40% of women say they prefer a male boss compared with 27% who say they prefer a female boss, while 29% of men say they would prefer a male boss, compared with 18% who prefer a female boss. This squares with the findings of a 2013 Pew Research Center survey. About three-quarters of men and women who are currently employed or have ever worked say they have no preference for working mostly with men or working mostly with women. Of those who do have a preference, though, both genders are more likely to prefer to work with men — a view that is especially pronounced among female employees. The Pew Research survey also found that women were less likely than men to say they would like to be the boss or top manager one day or are already the boss (44% of women vs. 60% of men). In fact, 53% of women say they would not like to be the boss. Although men across all age groups are more likely to aspire to be a boss or top manager, the gap between men and women is smallest among Millennials — those ages 18 to 32 in 2013. Among this generation, 70% of men who are not already a boss say they would like to be, compared with 61% of women.